This guide will take you through the seven different varieties of dragon found throughout RuneScape. Although dragons are very dangerous, they are also very rewarding when it comes to drops and experience. Green Dragons are level 79, with 750 Life Points. 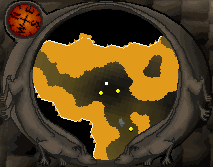 They are located in 4 different locations in RuneScape, all of which, are in the Wilderness. They also drop coins, runes, and herbs frequently, as well as a number of other items, including shield left halves, and various weapons and armor. The Warrior Helm provides an Attack and Defence bonus, but you may substitute this for a Berserker Helm or Rune Helm. You may also choose some other kind of helm, or none at all. The Glory Amulet is useful for its teleports, but you may prefer a Power Amulet, which provides better Defence, and is not as valuable if lost. 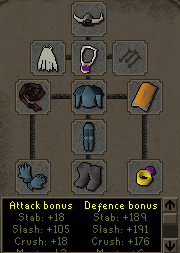 A Cape of Legends gives you good Defence for melee and magic, but you may prefer a Team Cape, or a God Cape, for its magic Defence bonus. An Abyssal Whip is not required, a Dragon Scimitar or Longsword will work also. 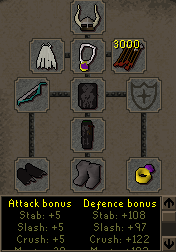 The Black Dragonhide Body gives you good magic Defence, also it give decent melee Defence If you can not wear Black Dragonhide, you can substitute this for a lower kind of Dragonhide, or even a Rune Platebody. The Anti-Dragon Shield is a must, you will die without it. Dragons can hit up into the 400s if you don't have an Anti-Dragon Shield wielded. 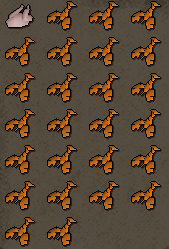 Rune Legs are good protection against the Dragon's melee attack, but some people prefer Dragonhide Chaps. 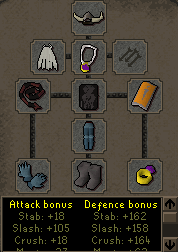 Rune Gloves are cheap, and effective. 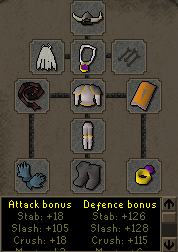 If you wish, you can always use higher gloves, or, if you haven't done the Recipe for Disaster quest, you can use Gauntlets or any other kind of gloves. Climbing Boots give you a strength bonus, but you may prefer Leather boots or Armored boots. The Ring of Wealth is purely optional, you may wish to not have any Ring at all, or you may want a Ring of Life. You may wish to use a different kind of food, or add more or less food, depending on your level. 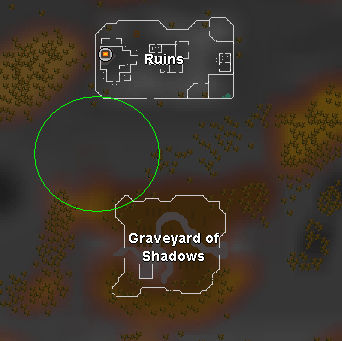 Because this location is just NorthWest of Edgeville, I find it best to teleport to Edgeville with Paddewa Teleport when banking. 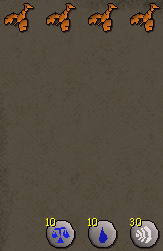 If you don't have access to that spell, you can always teleport to Falador or use your Glory Amulet to teleport to Edgeville. If you use the Glory, be sure to take a one-click teleport (such as an Ectophial) along with you also, incase you get in trouble with Revenants. Once again, you may wish to use different food, or use more or less food, depending on your level. 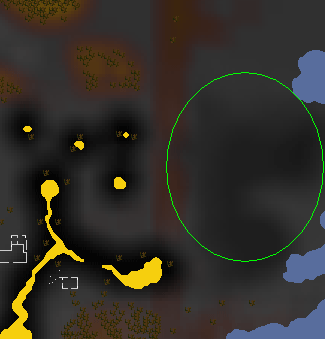 Once you have a full load, teleport to Varrock, bank, and walk back up to this location. You may want to use more or less food, depending on your level. 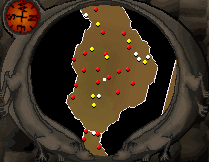 The fastest way to bank at this location is using Ancient Magicks. 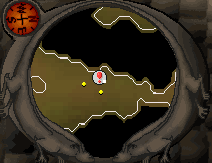 Use Carrallangar Teleport(Requires 84 Magic) to teleport into the Graveyard, and then walk up a bit to the Dragons, Afterward, use the Paddewa Teleport(Requires 54 Magic) to teleport into Edgeville Dungeon, and then go up the ladder and bank. 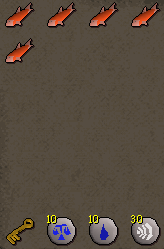 Alternatively, you can use a Glory Amulet to teleport to Edgeville and then walk back up the Dragons. This spot is the most unpopular spot for Dragons. It is very far into the wilderness and offers no quick way out if you get attacked by a Revenant Ghost. For this location, I recommend the same set-up as the level 24 Wilderness. Using Ancient teleports is the fastest way for these Dragons, but it still requires a lot of walking. You might also want to use a Glory Amulet to teleport to Edgeville and walk back up. Baby Blue Dragons are level 48 with 510 Life Points. 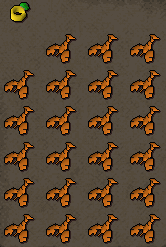 They are only found in one location in RuneScape. Since they are not yet fully grown dragons, they do not breathe fire, and you do not need an Anti-Dragon shield for them. All of your equipment for Baby Blues are personal preference. Any melee armor and a weapon works, and a ring is not required. 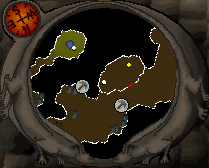 This location is past the Lesser Demons in the Taverley Dungeon. You need a Dusty Key to access this spot. For a more detailed map of the Dungeon, and a guide on how to get a Dusty Key, take a look at the Taverley Dungeon Guide. You will also find Blue Dragons at this location. Baby Blues do not hit too hard, which is why I do not bring too much food, or very good food. Depending on your level though, you may wish to use a different amount, or type of food. 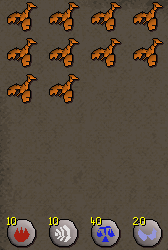 The Dusty Key is required to get to the Baby Blue Dragons, and the teleport runes are for banking. Blue Dragons are level 111 with 1,090 Life Points. 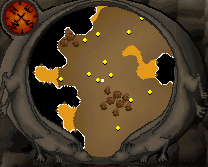 They are found in three locations within RuneScape. As with Baby Blue Dragons, I recommend melee equipment. Any armor above Rune is recommended, and once again, the Anti-Dragon Shield is a must. Any weapon works, although I recommend a Dragon weapon or an Abyssal Whip. 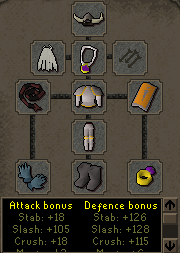 Your Cape, Helmet, Amulet, Gloves, Boots, and Ring choices are purely up to you, I personally use what's pictured above. Your best Dragonhide and Bow is recommended. Any Cape works, and your choice of Boots, Amulet, and Ring is up to you. You can also use any kind of Arrows that you wish, and any amount. 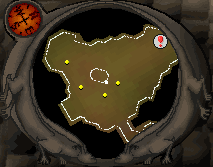 This location is past the Lesser Demons in the Taverley Dungeon. You need a Dusty Key to access this spot. For a more detailed map of the Dungeon, and a guide on how to get a Dusty Key, take a look at the Taverley Dungeon Guide. You will also find Baby Blue Dragons at this location. To range here, simply stand in one of the sides of the Dungeon. The teleport runes are for banking. 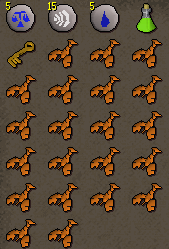 A Dusty Key is required to get to the Dragons, unless you have 70+ Agility. You may want to use more or less food depending on your level. You will want to bring less food if you are ranging. This location is a cage in the Heroes Guild Dungeon. There is 1 dragon here, and it is a good spot for rangers, as you can hide in one of the corners or outside of the cage. Also, if you plan on Ranging, take an Anti-Dragon Shield in your inventory, just in case a Dragon attacks you while you're picking up the drops. If you plan on meleeing this Dragon, you should bring more food. The teleport runes are for banking. To use this location, you must have completed the Watch Tower Quest. It has many Dragons, amongst Greater Demons and a selection of Ogres. You can use more or less food depending on your level. You'll of course want to bring less food if you plan on Ranging, as this location is great for Ranging. The Ring of Duelling is for banking purposes. 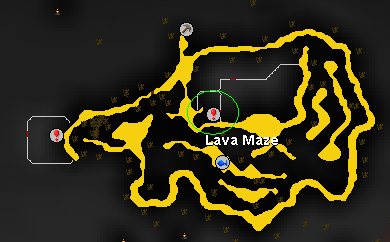 You can teleport to Castle Wars, bank, and then run back to the Cave. Alternatively, you can just walk to and from the Castle Wars bank. Also, if you plan on Ranging, take an Anti-Dragon Shield in your inventory, just in case a Dragon attacks you while you're picking up the drops. Baby Red Dragons are level 65 with 680 Life Points. 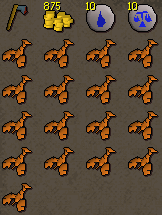 They are only found in one location in RuneScape. Like every Baby Dragon, they can not breathe fire, and so you do not need an Anti-Dragon Shield to fight them. I recommend Rune gear or above. I also suggest any weapon that is above Dragon, as well as a good Amulet, Cape, Gloves, and Boots. The Ring of Wealth is optional, you may switch that for a Ring of Life, or no Ring at all. The Anti-Dragon Shield is not required to fight Baby Red Dragons, but because the only location for them also has many aggressive Red Dragons, it is safer to have the Anti-Dragon Shield incase one of the Red Dragons attacks you. I recommend Rune gear or above. I also suggest any weapon that is above Dragon, as well as a good Amulet, Cape, Gloves, and Boots. The Ring of Wealth is optional, you may switch that for a Ring of Life, or no Ring at all. This is the only location to find Baby Red Dragons. It is in the Brimhaven Dungeon, past the Moss and Fire Giants. You do need at least level 22 Agility to access the Baby Red Dragons. This location also has several Red Dragons, which are aggressive. The teleport runes are for banking, as Ardougne has a bank right next to a ship that can take you to Brimhaven for a price. The 875gp is required to get into the Dungeon, you must pay the man outside before entering. The hatchet is required to get around in the Dungeon. 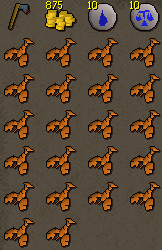 Red Dragons are level 152 with 1,450 Hitponts. 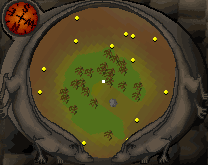 They are found in two locations in RuneScape. They also drop coins, weapons and armor, and a lot of other items. Pretty much the same as Baby Red Dragons. I recommend armor that is Rune or above, and a weapon that is Dragon or above. 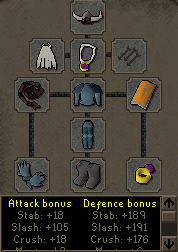 Any Helm, Cape, Amulet, Boots, and Gloves works. Also, no ring is required, but you may choose a Ring of Wealth or Ring of Life. Unlike Baby Reds, an Anti-Dragon shield is now required to fight these dragons. The Helm is strictly for its Attack and Defence stats. You may choose an Initiate Helm or another Helm. 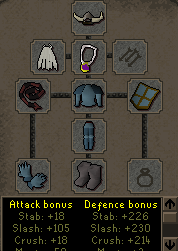 If you've completed the Fremennik Isles Quest, you should wear a Helm of Neitiznot for it's strength and prayer bonus. I recommend any Amulet with a Prayer bonus. I personally use a Glory, as it gives +3 to your Prayer. Once again, any weapon above Dragon works fine. The Anti-Dragon Shield is a requirement, so we must not forget that. Initiate Plate and Legs are best, as they provide you with Prayer, as well as decent melee Defence when you're trying to get to the Dragons. Monk Robes work just as equally when it comes to the Prayer. Any Boots, Gloves, and Ring works. This is the same spot as the Baby Red Dragons. It is past the Moss Giants and Fire Giants. The money and hatchet is required for the Dungeon, to get in and get around. The teleport runes are for banking. You can use more ore less food depending on your level. You can always bring more Prayer and Anti-Fire Potions, as well as food. Keep in mind that even though you have Anti-Fire Potions, you still need food and an Anti-Dragon Shield. After 5 minutes is up, the Dragon may hit you with its fire breath, and so you need to be prepared for that. 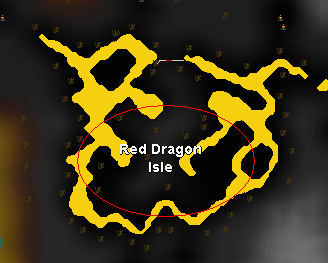 This spot is located in level 40 Wilderness, and it is not a very common place for players to hunt Red Dragons. The teleport runes are for banking, as well as getting away from a Revenant Ghost if needed. 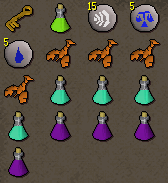 Keep in mind that you can always use the Mage Arena Bank to bank your loot, so teleport runes are not needed. You can always use more or less food depending on your level. 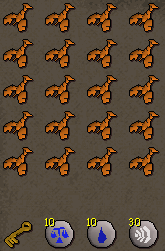 Baby Black Dragons are the newest addition to the Dragon family in RuneScape. 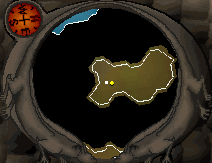 Only 1 Baby Black Dragon exists within the land. They are level 83 with 820 Life Points. All basic equipment here, and although you do not need an Anti-Dragon Shield to fight Baby Blacks, you must get past the Black Dragons, for which you do need an Anti-Dragon Shield. To enter this location, you must have at least started the Lost City Quest, and the Sir Amik Varze section of the Recipe for Disaster Quest. 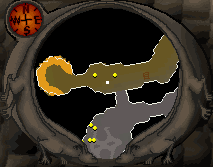 Once you enter the Evil Chicken's dungeon shown on the first mini-map, you must then climb down into the second dungeon, shown in the other mini-map. You need a raw chicken to enter the Evil Chicken's Dungeon, and a rope to get into the Baby Black's dungeon. You can always use more or less food depending on your level. Because this place is in Zanaris, you do not need teleport runes, as you can just run straight to the Bank. Black Dragons are the strongest Dragons in RuneScape, aside from the King Black Dragon. They are level 227 with 1,990 Life Points. They are tough, and capable of hitting 170s often. They also drop coins, weapons, armor, and various other items. 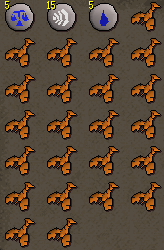 Good melee armor is a must, as these Dragons will hit you hard. The Anti-Dragon Shield is also a must, you won't get very far without it. Any good Dragon Weapon or above is suggested. Initiate is what I personally wear, but Monk Robes work just as well. 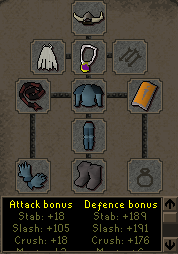 If you prefer, you can use an Initiate Helm instead of a Fremennik Helm. Once again, and Dragon weapon or above works, and an Anti-Dragon Shield is a must. 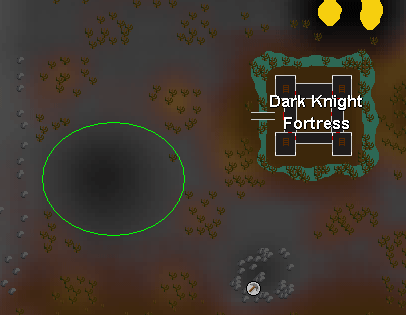 This is the newest location for Black Dragons, and it is in Zanaris, right near the Entrance. To enter this location, you must have at least started the Lost City Quest, and the Sir Amik Varze section of the Recipe for Disaster Quest. You need a raw chicken to enter the Dungeon. Because it is in Zanaris, you do not need any teleports to bank. You can always use more or less potions. The food is just in case things go wrong. The teleport runes are for banking. An Antipoison is recommended, as you have to pass a few Poison Spiders on your way. The Dusty Key is required to get into this section of the Dungeon, unless you have 70+ Agility, for which you can use the Agility Shortcuts. Pretty similar to the melee inventory. The only difference is adding Prayer Potions and Antifire Potions, and taking away food. 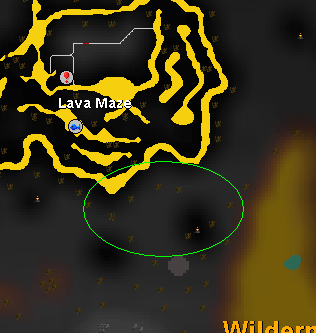 This location is found by climbing down the ladder in the center of the Lava Maze, and running past the Greater Demons found in there. I do not like this location personally, as it is very hard to get to, and is no where near a bank. The teleport runes are for banking, although you can just use the Mage Bank. You may want to use more or less food depending on your level.